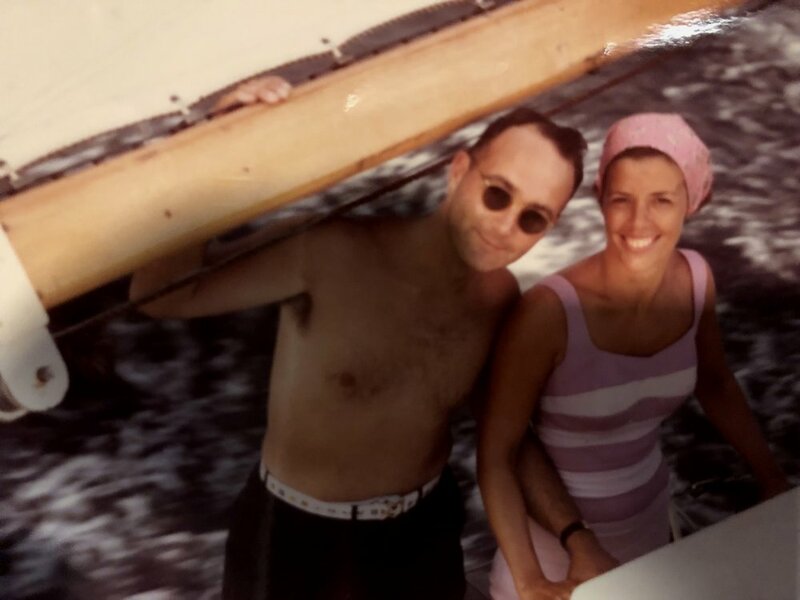 Daddy with my sister Puddy somewhere in Long Island Sound. My father had two wives. When I read that sentence it stops me in my tracks a teeny bit. It’s a big statement, one many of you can make as well. It’s funny to me though. My father was not the type of man you would predict would be married multiple times. The fact is, he was not the man any sane woman would want to divorce, nor would he have given up on his wife without very good reason. Bill Thorn was a true gentleman. He smiled easily, used his words and giant squishy bear hugs to express great love, and was a big ol’ bundle of humor, smarts, empathy, and appreciation for the world and people around him. This World War II ambulance driver, boy from Bronxville, and proud Choate alum, ran a big department of a big insurance company in New York. He had a gazillion friends who he only spoke highly of. My three favorite things about my father were holding his beautiful hands, his honest answers, and his belly laugh. An absolutely devoted sailor and father, he raised his children on the family boat. As a Marine insurance man, he made sure we could all swim very well when we were very small.. I don’t remember an age when I had to wear a life jacket or could not join my family swimming off our boat in Long Island Sound. My parents sometime before I was born. My father’s first marriage was to my mother Patty, a woman he met at a party in a basement in Bronxville. This sentence makes me laugh because I too attended many parties in basements in Bronxville. My parents had each gone to the party with a date. Yup, not a good day for either date. I don’t even know their names. Helen Stewart, the hostess, had planned a picnic, and it rained. The party was moved into her parent’s basement and Thorn history was made. My parents were in college, after their engagement my mother transferred to be closer to my father who was at Yale. They built a life together, had a great love story, and had three children together. They lived within a block of the house where they met. There were a lot of laughs, a lot of child antics, and a house full of teenagers driving my mother batty during the 60s. I vividly remember my parents glued to the TV news while my teenage brother was at Woodstock. We spent a lot of time in Chatham and Edgartown, always on the water, always on a boat. My mother would tell my father which direction to sail and when to come about so that the sun shined on her. Patty and Tricia at American Yacht Club 1965. My brother and sister were 12 and 14 when I was born. At one point that year I thought it would be absolutely perfect for my father to marry the divorced mother of my playmate next door. We could be sisters! My friend thought so too!! We told all our friends in second grade that our parents were getting married. My father was at a cocktail party a few weeks later when a group of mothers approached him to inquire about his upcoming nuptials, apparently my father had just taken a big sip off his gin and tonic which he accidentally spit all over the room in shock and horror. Needless to say I got a lecture about spreading this story over my Lucky Charms the next morning. I’m happy to announce that my father would find love again, right in front of him, with a wonderful woman who had worked for him for years. My stepmother, whom I also call “my mother” just to really complicate things, was his happily ever after. Best friends, great loves, companions, spouses, joyful partners in all things good for 35 plus years. She brought him great comfort, great joy, and made him feel so very loved. She dedicated the last several years of his life, to taking impeccable care of him as he succumbed to dementia. My parents (Bill and his wife Saralou) in Ireland kissing the Blarney Stone. I was the 7th grade photographer. My father had two wives, he modeled happy marriage to his children, not once, but twice. Saralou and Tricia Lakeville, Ct.
Bill Thorn, very happily married to Saralou for over 35 years. When I decided to leave my first marriage, I had been watching the movie You’ve Got Mail over and over. In the movie Meg Ryan talks about having a dream of someone, the right someone. I had that dream too. Although my first marriage was nothing like I had hoped, it didn’t sour me to marriage. I always knew I wanted to get married again. I like marriage. I just needed the right person to share the journey with. I wanted to find the love of my life. As a single mother with FIVE, yes FIVE young children I knew this would not be easy. My college friend Aimee, who was divorced with three small children assured me that there were men out there who were not afraid to date women with children. I have to admit I didn’t believe her at first, but was happily shocked to find out she was right. I used to say my 5 children were like a colander for dates. Only the good ones (for me) made it through my very special filter. I had one very important thing I wanted in my life partner. I didn’t know what he would look like, do for a living, or how many children he would have. But I knew one thing. I wasn’t getting married again without one key word playing a huge role in my decision. I realized that what my father had in both of his marriages was something I wanted, one simple word from the wedding vows. I wanted someone to cherish, and I wanted someone who would cherish me. It as that simple. I was optimistic this was possible. Because I’m Bill Thorn’s daughter. And he showed me it was. And he was right.